Apple’s recent announcement of the iPhone 6 comes at a time where Android is trying to cement its place as the dominant mobile operating system. Both iPhone 6 models feature larger screens to combat popular Android smartphones like the Samsung Galaxy Note and LG G3. Add in new features and functionality from iOS 8 — the latest iteration of Apple’s mobile operating system — and rumors about the iPhone’s demise now seem greatly exaggerated. Let’s take a closer look at the iPhone 6’s specifications and feature set. 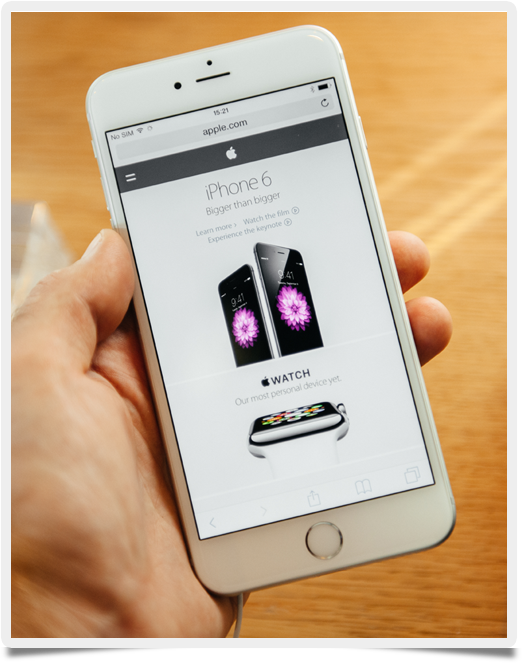 Both iPhone 6 models sport noticeably larger touchscreens. The iPhone 6 features a 4.7-inch screen, while its bigger brother — the iPhone 6 Plus — comes in at the 5.5-inch mark. The iPhone 6 Plus is capable of a resolution of 1920 x 1080 pixels, which is more than enough screen real estate to run a mobile speed test. The new touchscreens are also thinner which allows both iPhone 6 models to be Apple’s most slender smartphones to date. The Retina HD display and iPhone camera are utilized nicely by the improved video and photo capabilities within iOS 8. Other enhancements include a wider viewing angle, and landscape orientation on the iPhone 6 Plus. The screen on the larger iPhone 6 simply rivals anything out there in the smartphone world. Like the iPhone 5, the iPhone 6 models also contain 1 GB of RAM; previous iPhone models used anywhere from 128 to 512 MB. This added RAM makes the internal processing chip run more efficiently, giving the user a quicker and smoother smartphone experience. And faster mobile speed test results as well. Speaking of which, the smartphone’s main dual core A8 microprocessor is clocked at 1.3 GHz, with the specialized M8 motion co-processor handling the iPhone 6’s array of sensors, including the accelerometer, compass, and more. Of course, there is a GPU paired with the enhanced Retina HD display on both iPhone 6 models. Retail prices for the iPhone and iPhone 6 Plus start at $199 and $299 respectively. Of course, deals from a variety of mobile carriers are available, so the wise consumer does their research before making a final decision. With the iPhone 6 firing the latest salvo in this smartphone war between Apple, Samsung, LG, and Google, expect the heated competition to drive innovation from all companies in the mobile technology sector. Ultimately, the mobile phone user stands to benefit as new features and enhanced specifications continue to enthrall.